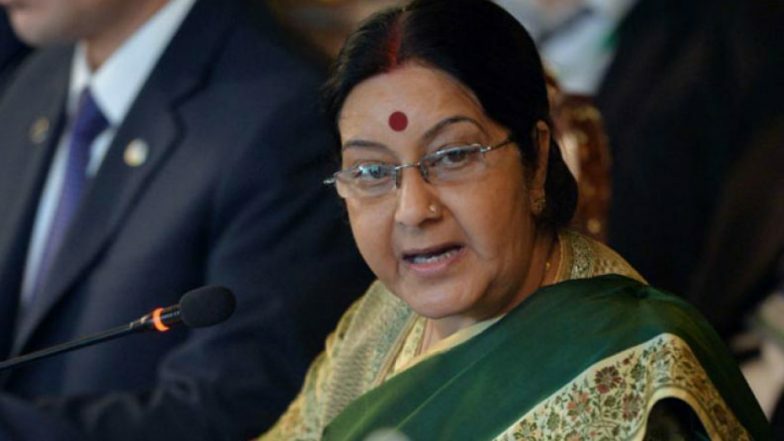 New Delhi, March 26: External Affairs Minister Sushma Swaraj on Tuesday asked Pakistan to return to the family two minor Hindu girls who were abducted, forcefully converted to Islam and married off on the eve of Holi in Sindh province. "Forced conversion of Hindu girls in Pakistan: The age of the girls is not disputed. Raveena is only 13 and Reena is 15 years old. Even the Prime Minister on Naya Pakistan will not believe that girls of this tender age can voluntarily decide about their conversion to another religion and marriage," Swaraj tweeted referring to Pakistan Prime Minister Imran Khan's 'Naya Pakistan'. Pakistan: Two Hindu Teenage Girls Abducted And Forcibly Converted to Islam on Eve of Holi; Sushma Swaraj Seeks Details From Indian Embassy. The Pakistan Prime Minister had on Sunday directed that an "immediate" probe be conducted in the case. On the same day, India had shared its concerns through an official note to the Pakistan Foreign Office over the incident. India sought suitable remedial action by the Pakistan government to protect and promote safety, security, and welfare of its own citizens, especially from the minority communities. Pakistan human rights activists have claimed that this is another case of forced conversion and abduction, which are becoming increasingly common in the southern region of Sindh. The girls were abduction from their home in Daharki taluka of Ghotki district in Sindh province on the eve of Holi and converted to Islam.